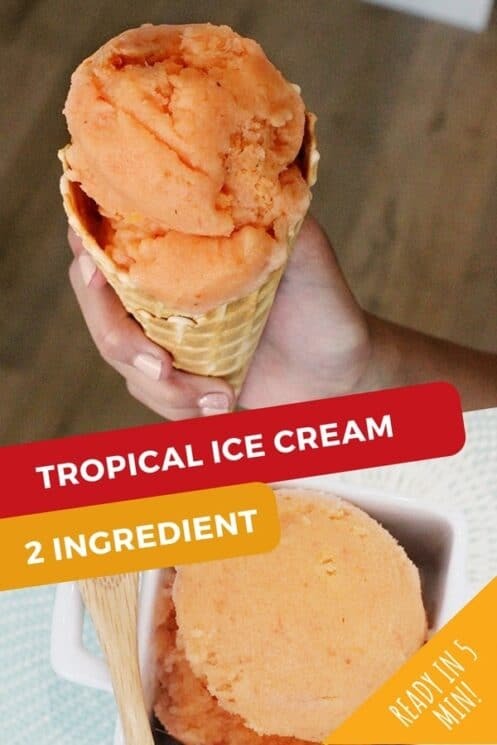 All you need is 2 ingredients and 5 minutes to have this healthy tropical ice cream ready! Kids can make it themselves! 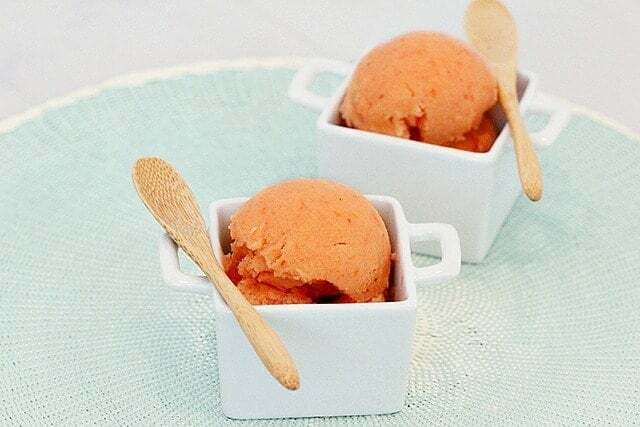 When my daughter Erica was 10 years old, she insisted that she invented this healthy ice cream recipe, and insisted I post it. That was nearly 8 years ago! She and her friends made this healthy ice cream so many times one summer, I thought they would start a business! That summer, I remember her being so anxious to share it with other kids in the neighborhood, so they also could know and taste how good it was. She even brought my bag of frozen fruit to the neighbors to prepare it, because we were out of milk and she needed her daily fix. What I love about this healthy ice cream, is that it is just fruit and milk. It could be a healthy snack, or even made for breakfast. We can make it so quickly because we START with frozen fruit. 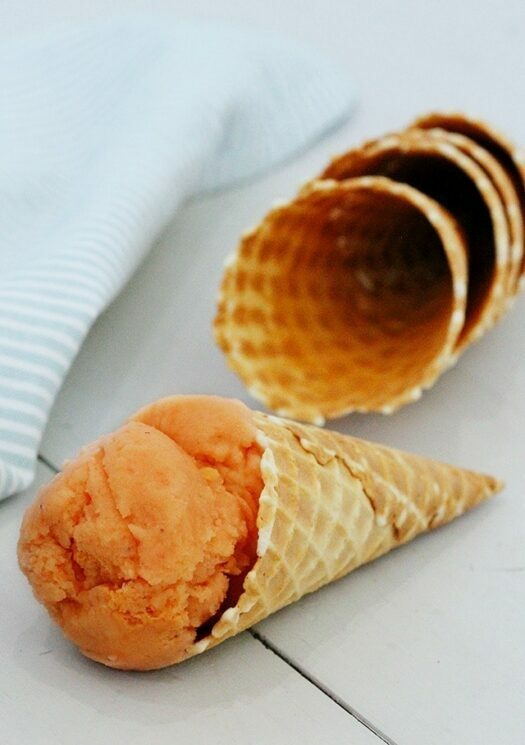 Blend with the milk while still frozen, and you have instant ice cream! Put the fruit and milk into a blender, and blend until fruit is smooth. Start with 1 cup of milk, and slowly add one more until the blender starts to work. You know how sometimes if there isn’t enough liquid, the blender just won’t go. Depending on how good your blender is, you may have to add more milk until it begins to move. Don’t add too much though, because then you’ve turned your ice cream into a smoothie! Not that there is anything wrong with that. No sugar added! We are huge fans of natural sugar through fruit, and we don’t hesitate one bit to encourage fruit here. Because fruit is combined with all the nutrients, minerals, and fiber of the whole food, it’s an excellent source of sugar necessary for kids to have energy and grow. The MyPlate Icon includes a side of dairy. This would be a perfect compliment to follow any healthy, balanced meal! It’s easy to make! I mean, my 10 year old was making it! It’s super delicious! 10 out of 10 kids agreed. 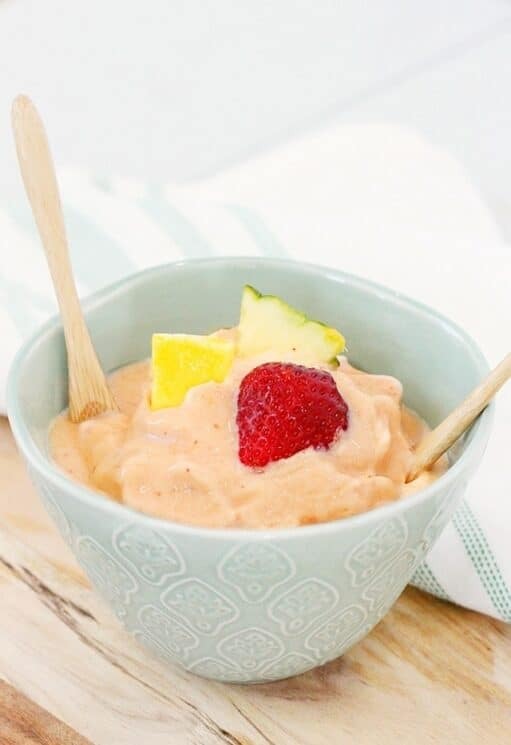 3/4 cup of this frozen fruit blend has 130% of your daily requirement for Vitamin C! So, for one last summer hoorah, make some ice cream! Add all the ingredients to a high powered blender; blend to a smooth, ice cream consistency. This can be served immediately after blending if desired, or freeze to be served later. Can you freeze leftovers, or does it get super hard? We’ve eaten it all in one sitting, so I don’t know. We’ll try it today and report back! I wonder if this would work with alternative “milk”… my daughter has dairy allergies and it would be so nice to let her have “ice cream” too! The added benefit would be that I could make my own coconut milk and it would not contain soy (like most dairy-free frozen snacks)! I know my kids would like it. Tell Erica it’s a great recipe! I think this sounds good and the perfect ice cream for the end of summer fun. I love icecreams…I. O my God it looks so goodie-goodie. I will share my experience after trying it. Thanks a lot in advance…!! add to the discussion. It is caused by the fire displayed in the post I looked at. 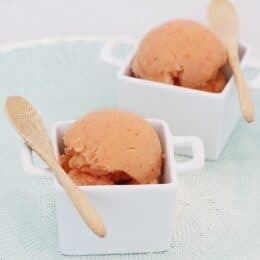 And on this post Tropical Ice Cream: Easy, healthy, and delicious! Is it only me or do some of the responses come across like they are left by brain dead individuals? 😛 And, if you are writing on additional sites, I’d like to keep up with you. Could you make a list all of your communal sites like your Facebook page, twitter feed, or linkedin profile? or e-newsletter service. Do you have any? Kindly permit me realize so that I may just subscribe. Also, bananas add fabulous natural sweetness and work as a great thickener. Thanks for the fabulous post!